The Acton Community Chorus is open, without audition, to all singers age 18 and older. * We do ask all members to make a serious commitment to our rehearsal and concert schedule upon joining. Our next Open Rehearsal is January 28, 2019. Open Rehearsal means all are welcome with no obligation, with no audition. Come try us out! We rehearse every Monday night during the school year from 7:30 to 9:30 pm at the Faith Evangelical Free Church* (54 Hosmer Street, Acton). Exceptions are noted in our schedule, available at the beginning of each season. 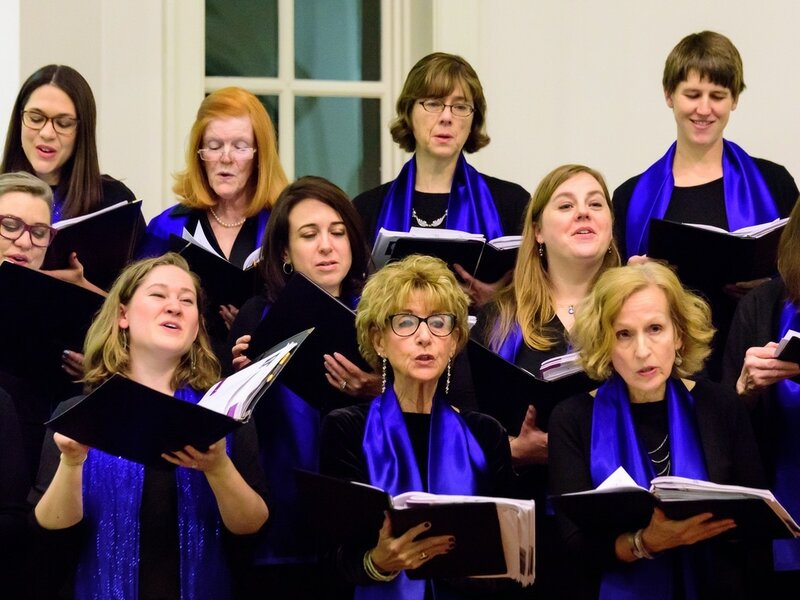 The first (open) rehearsal provide an opportunity for interested singers to come and meet our members, Director, and Accompanist and to test out the Acton Community Chorus experience. Rehearsals begin promptly at 7:30, so singers are asked to arrive by 7:15 to allow time for sign-in, music distribution and other administrative tasks. Rehearsals end at 9:30 pm. While we hold open rehearsals at the beginning of each season, you may contact us at any time about membership. Click here. Our members’ musical ability ranges from no previous choral experience to substantial vocal training. Some of us are learning to read music; others are practiced sight-readers. ** We range in age from teenagers (18+) through senior citizens. We are business people, students, educators, engineers, homemakers, and retirees. Through singing, we give of ourselves to each other as well as to our community, and enrich our own lives in doing so. Our members pay dues of $85 ($75 for seniors 65+) each singing season (Winter & Spring). These dues, as well as yearly fundraising and concert ticket sales, cover our expenses for the year including Director and Accompanist compensation, space rentals for rehearsals and concerts, sheet music purchase and other creative or administrative expenses incurred. In addition to dues, for some concerts there might be other minimal fees, such as for voice part CDs (optional), purchase of a special piece of music, or a concert dress accessory. Those who cannot afford to pay the membership dues but would like to sing are encouraged to make arrangements with ACC's President to pay what they honorably can. No one will be denied the opportunity to sing because of an inability to pay the dues.